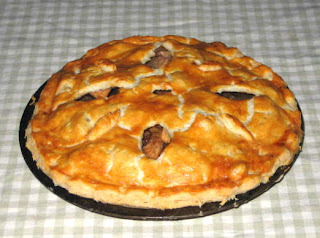 Peel, core and slice apples, prepare and rest the dough, roll the dough, line the pie pans and bake the pies. I was slammed bad! I was in the really tall weeds before I even started! Peeling, coring and slicing the apples wasn’t a problem because I have nifty hand machine that does all three tasks at the same time. The dough is another story. In order for baked pie dough to be light and flaky it has to be worked as little as possible and it has to stay as cold as possible through the whole process. And, it needs a rest, like at least 1/2 an hour in coldest part of fridge. For dough I used fool proof formula of 3-2-1 ratio for flour-fat-water and for fat I used 1 part butter and 1 part pure lard. Since my butter and lard were in freezer all I had to do is carefully cut off amount I needed and grate it directly into the flour, put the mix in my Cuisinart, pulse it couple of times, add ice cold water and pulse it again twice or 3 times. Before I started to work on the dough I put my marble slab outside in the snow. In summer I put it in freezer for few minutes. From food processor dough is placed on a cold slab and kneaded till the dough holds together and you can form a ball. Place in plastic bag flatten and put the bag in coldest part of fridge for at least 1/2 an hour. Hardest part over, it was time to assemble. Whisk the flour, salt and sugar together in a large bowl. Using a standard box or potato grater grate the frozen butter into the flour and toss lightly with your fingers until it is thoroughly combined. Sprinkle in ice water and mix with your fingers until the dough comes together in a ball. Divide it into two pieces, making sure one half is slightly larger than the other. Wrap in plastic wrap, flatten and chill for at least 30 minutes or even overnight. Resting will help tenderize the pastry and make it easier to roll. 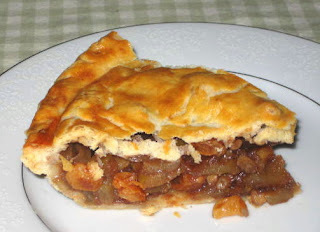 Remove the pastry from the refrigerator and allow it to warm slightly, just until it is pliable. Lightly flour your hands, the rolling pin, your work surface and the dough. Roll out the larger pastry disc into a circle large enough to slightly overlap the edges of an 8-inch glass pie dish. Transfer the dough to the pie dish by folding it into quarters then unfolding it in the dish. Toss the apples with all other filling ingredients. 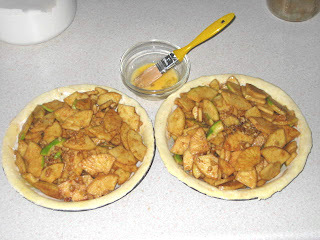 Add the apples to the bottom crust then roll out the remaining smaller disc and carefully place over the top of the pie. Roll and crimp the edges of the dough together, tightly sealing them. Poke a few vent holes into the top of the pie and place on the bottom rack of oven. Baked for 10 minutes in 450 °F oven and then lower temperature to 350 °F and baked for another 45 minutes or until the crust is golden and juices are bubbling.